Dan Phalen (Crestonwood) and Norm Abram inspired Router Table in Paduok, Maple, Walnut with a Bench Dogs Router Lift , Porter Cable 7518, Hartville tool Utilitape track and a red light, because I can. I named her Roxanne. Ok, now I have that song stuck in my head! Thanks a lot! BTW, very nicely done sir! HA! Me too… honestly the name came to me as I typed ‘red-light’ for the description… Now I want to get my ‘Police’ station going on Pandora! That is beautiful, great job. On the one top large drawer there is a metal disc and not the other drawers is that a design item or a lock? Design item and a cover up for a mistake… I made a 24” lamination panel for the drawers thinking they were 12” x 12” each (measure once, cut twice…) they were in fact 13 1/2 in. I chose to make another blank and end join the lamination with plain paduok. 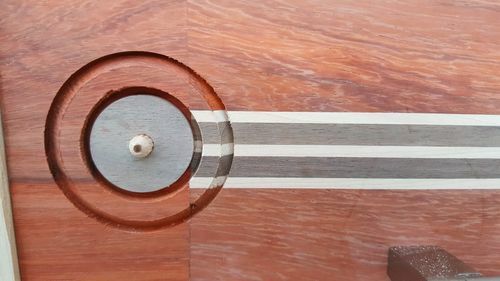 Once I had it end joined, I had to dress it up – I chose to use a hole cutter, then a smaller forstner, then use a ‘washer’ made out of walnut pegged in with a dowel to break the gap as it were. Once I stain it (tung oil) I’m sure it will pop even more! What did you do for dust collection? Wow! This router table is a wonderful eye catcher and those drawer fronts look like they are on fire. It’s a very nice practical router table and is a great addition to your shop. That is a Dandy Router table and pretty too. Did a nice cover up. One of the most important parts of wood working all too often is being able to successfully correct a mistake. Job Well Done! You don’t have to turn on your red light…. Roxxxannne. That is a real nice router table!! Tung oil, excellent choice! Nicely done table. Top notch… well crafted and good looking too! Nice work! Excellent, needs something….. A Red Light!!! !